My husband went to the barn with me, camera in hand. The barn owner, my friend Stacey, was in attendance as well. I'm pretty certain both of them were a little worried about how Eddie might react when I swung a leg over his back. 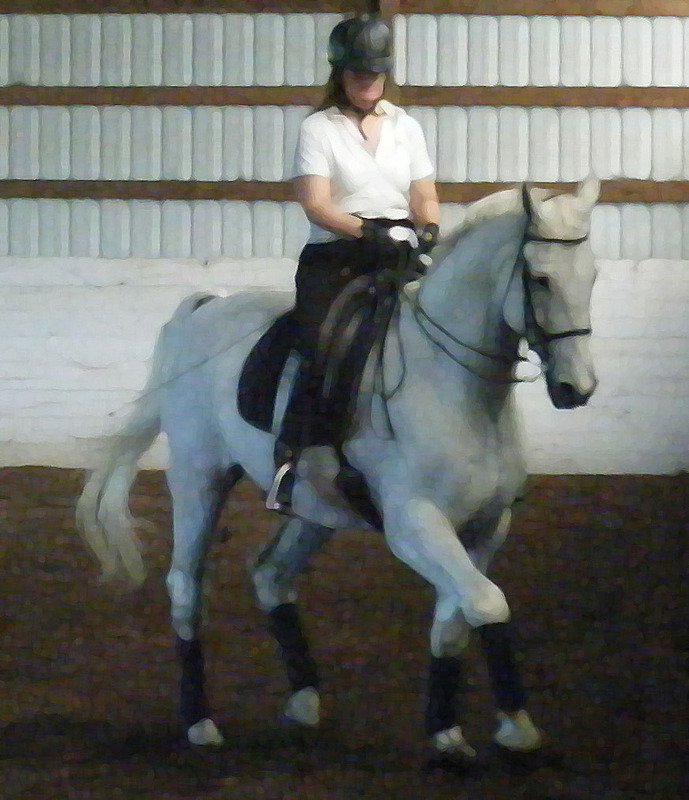 After all, the last time I rode him was October 2010. Even the vet warned me not to get bucked off. Reins in hand, I stepped into the stirrup from the mounting block, settled into the saddle and … Eddie moved forward as if the confinement of the last nine months had never happened, as if he'd had his usual work-out yesterday, as if he expected me there on his back. He went to work, striding forward solid and strong. We made it three quarters of the way around the arena before I started to cry. Even my husband forgot to take pictures. Next week we may be permitted to trot. I'm fairly certain I won't be crying, but I sure as heck will be grinning. Honestly, I'm thrilled for you! He is a gorgeous horse. I'm glad it is almost over. Susan, I am so happy for you and Eddie!! I wish you both all the best in his careful return to work. Me too, Margaret! He's so happy to be back to work, and such a good boy. Thanks, Studio at the Farm! Truth--I'm afraid to do anything other than what Eddie's vet approves. Far better to be cautious! That's super about Eddie. Horses surely can surprise you can't they? Hope things continue just as nicely. I recently had a similar experience when I started riding my formerly-third-level TB after a layoff of over a year. (Partly due to my health issues.) She's super-sensitive and had started becoming a little difficult when I stopped riding. So I was somewhat apprehensive and had actually delayed getting on again because of my lack of fitness and worry about what she might do. She's been as nice as can be. It seems moving back to a former barn and separating her from "her herd" (my retiree and my husband's mare) has really relaxed her. (She doesn't have to worry about them and keep track of them any more. )She's even stopped cribbing. Never heard of that before. Good luck with Eddie and do take it easy. I know how tempting it is to "just do a little more." Thanks, Kathy! How interesting that your mare quit cribbing when you moved her. I've never heard of that either. Must have been the perfect move for her, though! Susan, I'm teary too, and I've never even met you or Eddie in person. I'm really happy for both of you and I hope he continues to make steady progress. Thanks, Ellis! I'm hoping so too. I'd love to be able to get him working again -- even close to the level he was at last year. But he's such a fun horse to ride and a wonderful companion, that just being able to ride him and know he's comfortable is worth it. Wonderful--and stunning description, Susan! You're making me cry, too. Thanks, Susanna. I'm discovering that fractured coffin bones are not as uncommon as I'd originally thought, and only in extreme cases is the prognosis poor. It does take a long time to heal, though. How long was it before you were able to put your mare back to work again? Thank you, Christina! I can't imagine giving up on him -- not when he's so consistently positive himself. The Horse, Dog and Cat Paw-Wow sound like fun! I must click over and visit. Thanks for the tip! What a pretty horse. It sounds like he's on a good program on his way to soundness. Good luck. Thank you, Patricia. We're up to doing some trot now, and so far so good. He feels very solid. Keeping my fingers crossed!